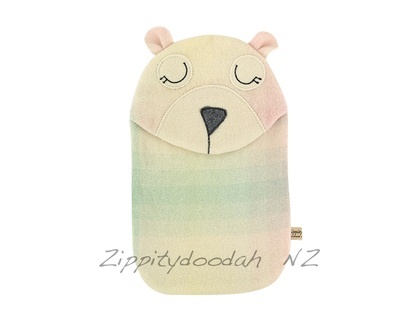 A beary cute but practical Hot water bottle cover, made from a thick vintage 100% NZ wool blanket, handmade in NZ to my own unique design. The perfect cuddle buddy for cold nights or late nights watching movies on the couch! Wonderful shades of bright apple green,a dash of olive and some warm caramel. Shy sleepy Bear Hottie Cover can double as a pj case over summer or better still squeeze your pj's in with your hottie while you have your bath and he'll pre-warm your bed and your p.j.s! Features blanket stitching details for extra homemade feel good craftyness. Cute little ears that like listening to bedtime strories or just for listening in the night. I have more than one availlable, each one is individually made and the pattern placement will be slightly different, please enquire for different colour availability. Copyright Zippitydoodah 2012, all rights reserved.